Chloe Gorman, journalism student at Southern Connecticut State University, reported this story in 2017 as part of Journalism Capstone coursework on World War I.
That’s how Nancy Bastian, the archivist for the Charlotte L. Evarts Memorial Archives, Inc. in Madison, describes the place on which the World War I commemorative boulder sits. The nearly 6-foot-tall by 5-foot-wide boulder sits in a memorial garden on Meeting House Lane, across from the old Memorial Town Hall. The Town Hall itself also has a memorial; two large plaques on either side of its entrance that contain the names of every Madison resident who fought in World War I. 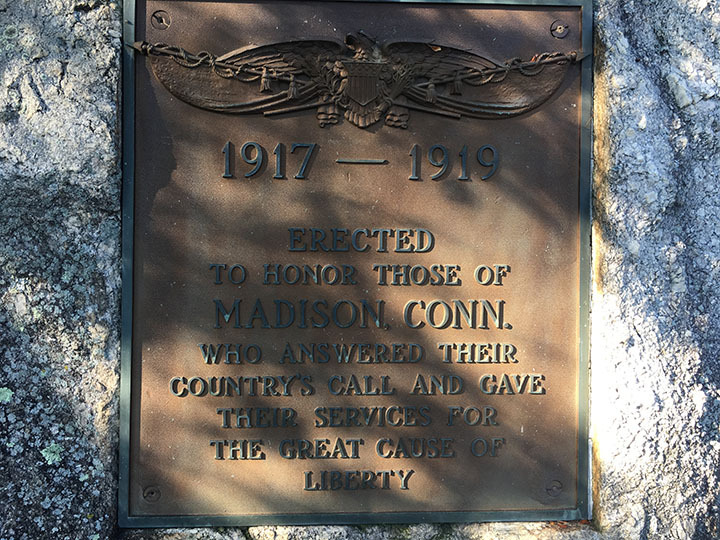 The boulder was dedicated in 1924, six years after the war ended to “[honor] the service and sacrifice of Madison residents during who served in the military during World War I,” said Bastian. The memorial followed a large wooden sign, containing the Honor Roll, according to Bastian. Each name was painted on the 8-foot-tall sign by H.R. Gladwin, a painter who was paid $65.21, she said. By the end of World War I, the sign had 74 names. The sign was removed in 1921, and the town voted to inscribe names on the two marble plaques on the entrance of the town hall in the same year, said Bastian. Madison’s population at the time of World War I was around 2,000 people, according to a report by the Connecticut Department of Economic and Community Development. Gerard said seven people from Madison perished in the war. One of those who died, Paul Pavelka, left home at only 15 years old, and was a part of the Lafayette Escadrille, a squadron comprised of 38 Americans and seven French pilots formed before the United States’ involvement in World War I. According to Gerard, Pavelka led a daring life during his time in the war. This included surviving a crash landing on only his second flight in August 1916, and being ejected from a car after falling down a ravine in August 1917. Pavelka left the Lafayette Escadrille in January 1917 and was awarded the French Service Medal Croix de Guerre with Palm for his bravery, according to Gerard. On Nov. 7, 1917, Pavelka was “breaking” new cavalry horses and was bucked off one, crushed by it. He died four days later, said Gerard. Pavelka felt joining the war was his civic, honorable duty, said Gerard. The monument was a way for the town to show its respect and keep history alive for posterity.